Product prices and availability are accurate as of 2019-04-19 09:57:13 UTC and are subject to change. Any price and availability information displayed on http://www.amazon.com/ at the time of purchase will apply to the purchase of this product. Why choose HOMY KITCHEN FAUCETS WITH PULL DOWN SPRAYER ? - Swivel spout,perfect for twin drainer sinks. - Quarter turn ceramic disc cartridge for Smooth and Long Lasting Operation. - Compact and precise connection between every part. - Pull out the sprayer, very convenient to use, flexible and multifunctional! - Two Types of Outlet: shower and DC. Different ways of water make the daily cleaning more efficient! - Add a modern touch to your kitchen with this elegant kitchen faucet with sprayer. - Whether your decorating style is traditional or modern,our products complement the home improvement project and add a generous,luxurious feel while protecting your health, safety and environment. Water Supply Hose (Cold Water Hose & Hot Water Hose): 2x 60cm/23.6"
1. Please allow 1-2cm error due to manual measurement, please make sure you do not mind before you buy. 2. The colors may have different as the difference display,please understand. 3. Spiral spring braid tube replace the gravity ball, using more resilient when pull out sprayer head! 4.Please remember to install the seal ring to prevent water leakage. [HOMY KITCHEN FAUCETS WITH PULL DOWN SPRAYER]: Take advantage of the pull down reflex system, you can pull down sprayer from faucet tap for infinite maneuverability to make your everyday tasks more convenient. Flexible and multifunctional of expand washing range. Spiral spring braid hose replace the old style gravity ball, using more resilient when pull out sprayer head, and the hose automatically returns to its original position, docking smoothly and securely! Make the cleaning work easier! [TWO-FUNCTION NOZZLE WATER OUTLET & 360 DEGREE HIGH ARCH SPOUT DESIGN]: Shower mode and the DC mode. Different ways of water make the daily cleaning more efficient and conserve more water. Saving water system of 1.8 gallon per minute flow rate complies to the strictest water saving standard while maintaining great performance. Single handle lever is easy operation of temperature and flow control. High-arch spout design with 360-degree rotation offers more room for a variety of sink activities. PULLING TYPE of 59 INCHS HOSE - Quality stainless steel outer tube, ensuring quality and longevity, Beautiful chrome finish. 59 Inch (5Ft) fits most standard shower fixtures. 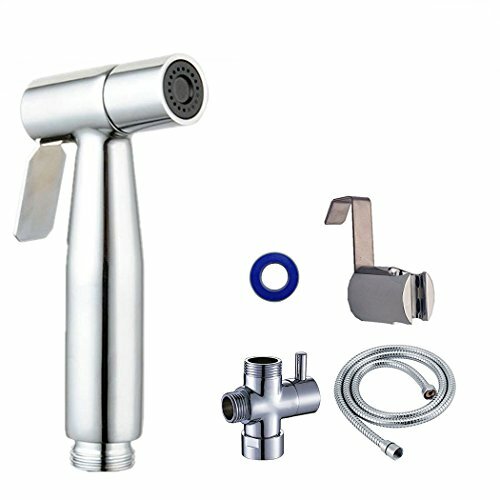 DESIGN FEATURE - Pull-type HOMY Kitchen Faucet Sprayer could pull a 1.5-meter-long stainless steel tube, more easily up to your place that you want to clean. It's not limited to the sink scope cleaning, Expanding the cleaning scope make your cleaning work more convenient and interesting. AFTER-SALE GUARANTEE - Our Pull-type Kitchen Faucet Sprayer Kit is backed by our manufacturer 30-day money back guarantee with 1 years' free replacement warranty.